This braiding hair is Hera black gold best quality European virgin hair bulk. 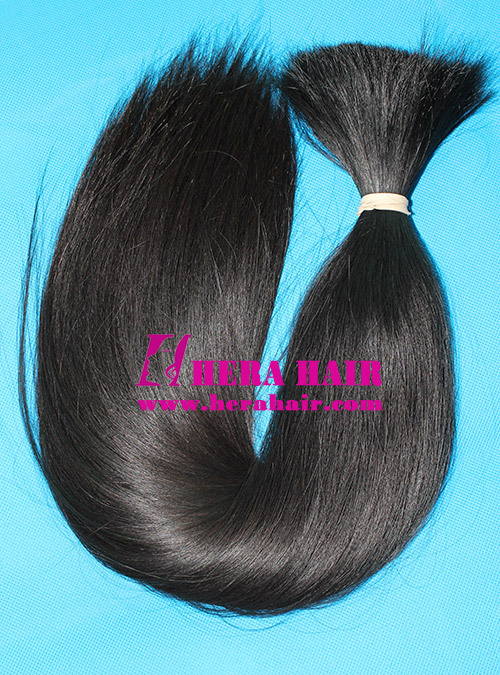 In the hair market, there are many kinds of hair materials, such as Indian remy hair, Indian virgin hair, Brazilian virgin hair, Mongolian virgin hair, Malaysian virgin hair, European virgin hair etc and Hera can supply all these hair marerials also. But only there is one kind of the best European virgin hair, which we call that hair is "Black Gold" and it's the hair what we introduce to you today. Unfortunately, we can't show the real face of this hair only by picture. You have to see and feel then you can know how beautiful of this hair. No matter ladies, man will like this hair because it's really really very good. The black gold best quality European virgin hair naturally shine, very thin and could last longer time. In fact, we always supply this kind of black gold best qualtiy European virgin hair but we mainly use this kind of hair for Jewish women wigs. Now we notice more and more customers like to order this kind of top quality European virgin hair, so we start to wholesale black glod European hair bulk and custom full lace wigs and lace front wigs. The black gold European hair materials are the best but it's not suitable for every one because its price is very expensive, which maybe twice than regular European hair. So you should choose that according to your budget. Anyway, it's worth to own one time for you and we believe you will love that black gold European hair. So no matter you want hair bulk for hair braids or want the best custom full lace wigs, please feel free to contact us for details.